1906 photo of Alsek Glacier, more than 300 metres thick, extending miles into what is now Alsek Lake. The red line indicates the terminus of the glacier in 2017. The survey of the boundary between Alaska and Canada was a massive project in formidable conditions with the primitive tools of the day. 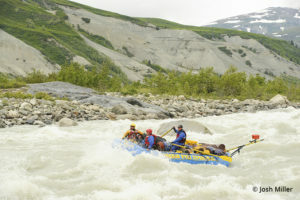 Fording rivers, traversing glaciers and scaling peaks were dangerous jobs and all-in-a-days-work for the survey crews. The process spanned thirty three years, ending in 1920. Fortunately for us, the process included a new technology. After “shooting” the triangulations from each survey point, the surveyors took a 360 degree panorama of glass-plate photos. These images were used back in civilization to draw the contour lines on the resulting maps. In 1906 the survey included the boundary through the exquisite scenery in what is now Glacier Bay National Park and the Alsek River. Coincidentally, the stunning images on the glass plates recorded the extent of the glaciers, vegetation and water levels in the world’s largest non-polar ice cap in 1906. We had discovered an international treasure documenting the world’s largest non-polar ice cap. Fortuitously, the glass plates were stored away in the archives of the Boundary Commission in Ottawa, and then forgotten. More than a hundred years later, water flooding from some leaking pipes in the ceiling of the building, forced the evacuation of the long forgotten cases of glass plates. Boxes scrawled with “Alsek 1906” lined a hallway. It is unclear how long they remained in the hallway until my enquiry in the government Email. Daniel Fortin, of the International Boundary Commission recognized the name “Alsek” from the boxes he had passed daily in the hallway. Time was of the essence since the government-of-the-day was on a disposal spree, trashing any stored documents of “questionable value”. As soon as possible I made the 5,000 kilometer journey from Whitehorse, Yukon to Ottawa and was not disappointed. 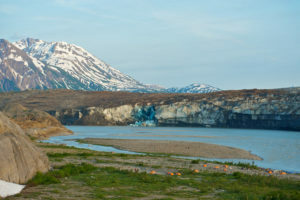 The slides revealed historic details of the Alsek River and the glaciers that make up the world’s largest non-polar icecap. But the grand bonus was realizing that the panoramic sequences remained, bringing the 360 degree views to life. 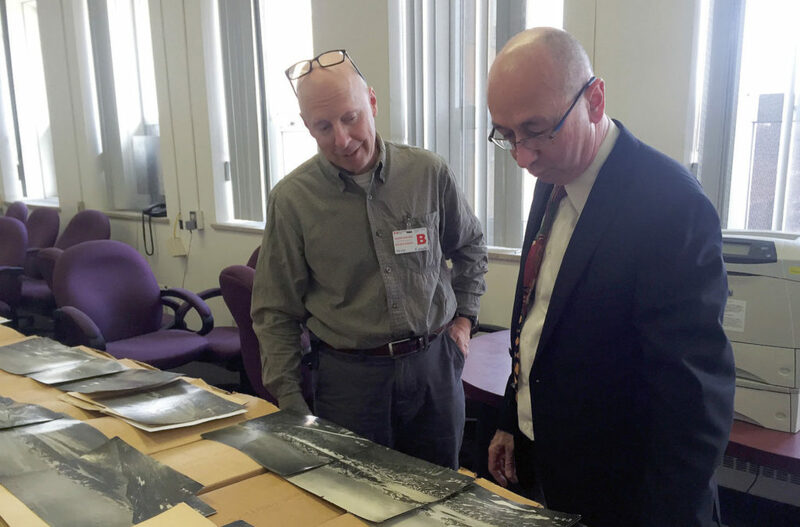 Neil Hartling and Daniel Fortin of the Canada / US Boundary Commission examining the photos made from the large glass slides, taken on the 1906 expedition, and almost sent to the dump. Highlights from the images include a view of the Alsek Glacier, filling what is now Alsek Lake with miles of ice nearly 1,000 feet thick. Another shows Walker Glacier extending into the river, more than a kilometer further than its present terminus. Academics are now studying the photos and we have laminated reproductions of these images that we take on our Tatshenshini and Alsek River journeys, allowing participants to marvel at the change in a hundred years and thrill at the stories of heroic accomplishments of the surveyors. All of this unleashed by a late night internet enquiry and some leaking pipes. 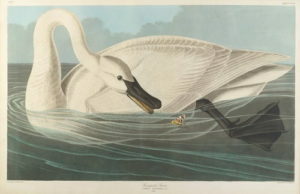 Is it possible to obtain a copy of any of these historic prints? Hi Chris, thank you for your interest in the 1906 Boundary Survey photo’s from the Alsek River area. The originals belong to the Government of Canada. The panorama’s we use were produced by a graphic art company for us. Feel free to contact us directly if you would like more details on these historic prints! Thanks!